A.P. 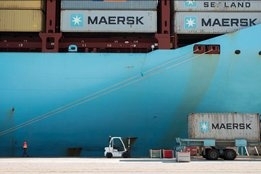 Moller – Maersk's decision to invest in a limited number of scrubbers for IMO 2020 "to ensure compliance in time" should not be taken as a sign the company has doubts over the supply of 0.50% sulfur bunkers, the mega-shipowner says. After being well know for its early stance on using low sulfur fuel to comply with the new rule, Maersk made the surprise announcement last month it would invest in the technology that enables vessels to continue burning HSFO. Some had suggested the move was a sign Maersk had doubts over the availability of 0.50% sulfur VLSFO in some markets, and that going the HSFO + scrubber route was seen as a better option than having to burn what would be even more expensive distillate products until the 0.50% products became available. "No, this is not the case. All our indications point to the fact that compliant fuel will be available, ensuring adequate sourcing and fuel quality is a matter of preparation and planning," Niels Henrik Lindegaard, Head of Maersk Oil Trading, told Ship & Bunker. "Our investment in a limited number of scrubbers should be seen in the light of our broader work to prepare for the 2020. Maersk is looking into all possible and available opportunities to ensure we are ready to comply with the 2020 sulfur cap, that is compliant fuels, LNG and scrubbers. Using scrubber technology is a small part of – and just one of several elements in - our overall 2020 fuel sourcing strategy to ensure compliance in time." Maersk is also playing a key role in ensuring the availability of compliant fuel, announcing in August a venture with Royal Vopak to deliver approximately 2.3 million mt per year of 0.50% sulfur fuel via a new bunker supply operation in Rotterdam. The operation in expected to cater to around 20% of Maersk global demand for compliant fuel. "We are looking into more bunkering facilities like this," says Lindegaard. The "IMO 2020" 0.50% sulfur cap on marine fuel goes into force from January 1, 2020. We are happy to expand our physical footprint, says Trefoil COO, Maurice Elfrink. Is the first North American port do so. Sufficient supply of compliant LSFO will be available to meet demand.